Abstract: The impacts of Climate change are now being felt at a regional level in cities like Melbourne. The impact of rising temperatures and increasing frequency, duration and intensity of hotspells and heatwaves on Melbourne and its urban heat island poses challenges in how to respond and adapt. There are multiple risks to human health, maintaining urban infrastructure and urban biodiversity. Countering heatwaves and climate change is a major social and political challenge and will require both rapid mitigation of carbon emissions for the long term and widespread adoption of urban climate adaptation strategies and behaviour at personal, business and government levels. John Englart 10 February 2015. This article started during my single subject study in Academic Research at NMIT (now Melbourne Polytechnic) during Semester 1 of 2014. The focus was selected in negotiation with my lecturer. A slightly abbreviated version was handed in as my major assessment for the subject. The other two assessments of the subject were an annotated bibliography and a formal classroom presentation, which was also published at slideshare. I received a high distinction for the subject overall. This literature review is structured in two parts: the first on Melbourne temperature and heatwave impacts from climate change, and the second on risk management, mitigation and adaptation to rising temperatures, heatwaves, and the urban heat island effect in Melbourne. I thought limiting my focus to one climate impact - temperature and heatwaves - and one location - Melbourne - would narrow the field substantially, but as I dug deeper and read more widely I found a wealth of relevant literature either relevant to heatwave impact or directly to my regional focus. The bulk of the references are peer reviewed academic studies, but some are academic working papers and presentations, reports to Government, and news articles including several by myself published on this blog, Sustainable Fawkner or Climate Action Moreland. In Australia we are experiencing rising temperatures with increasing duration, frequency and intensity of heatwaves. (CSIRO and BOM 2014) In particular, unusual heat events in 2013 and 2014 have been documented by the Bureau of Meteorology in several special climate statements. This has included Extreme November heat in 2012 across eastern Australia (BOM 2012); followed by extreme heat in January 2013 which the Climate Commission dubbed the Angry Summer (BOM 2013a, Steffen 2013); a prolonged autumn heatwave for southeast Australia (BOM 2013b); Australia's warmest September on record (BOM 2013c); and intense summer heatwaves in January 2014, one of Australia's most significant heatwave events (BOM 2014b, BOM2014c); and an exceptionally prolonged autumn warm spell over much of Australia in May 2014 (BOM 2014d). Accurate temperature records have been kept by the Bureau of Meteorology by the Melbourne Regional Office since 1910. These records show a long term increase in the annual maximum temperature linear trend of 0.08C per decade and an annual minimum temperature linear trend of 0.14C per decade. 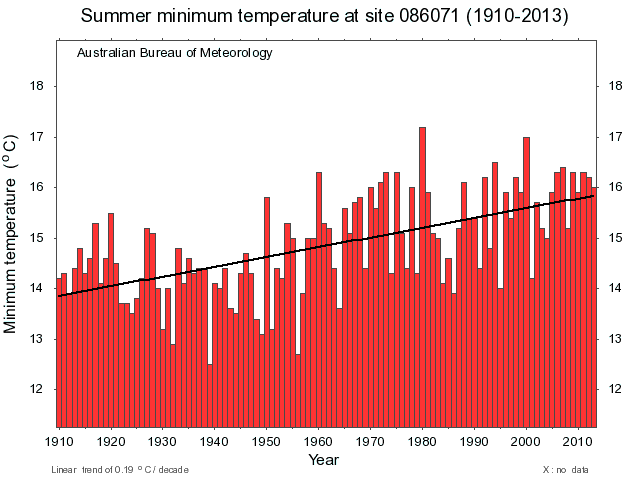 Annual mean temperature for Melbourne has been increasing at a linear trend of 0.11C per decade between 1910 and 2013. Future temperatures for Australia are projected by CSIRO and BOM (2014) 'to continue to warm, rising by 0.6 to 1.5°C by 2030 compared with the climate of 1980 to 1999; noting that 1910 to 1990 warmed by 0.6°C. Warming by 2070, compared to 1980 to 1999, is projected to be 1.0 to 2.5°C for low greenhouse gas emissions and 2.2 to 5.0°C for high emissions.' The increase in temperatures will occur through an increase in the number of hot days and warm nights and a decline in cool days and cold nights. Large cities and even small towns have an urban heat island effect which causes urban areas to warm up and retain heat during the night more than the surrounding countryside. Torok (2001) positively correlated the urban-rural temperature difference to population density here in Australia and compared it to similar correlations to the USA and Europe. Collecting data from a transect of Melbourne in August 1992 produced a peak UHI warming effect of 7.1C in the CBD with peaks in the industrial area to the west of Melbourne and in the medium density housing to the north of Melbourne. Princes Park is clearly shown as a trough indicating the effect park vegetation has on UHI. There are sharp drops in temperature at the urban-rural boundary. Heatwaves and hot spells are further amplified by the Urban Heat Island effect according to Li and Bou-Zeid (2013) "Not only do heat waves increase the ambient temperatures, but they also intensify the difference between urban and rural temperatures. As a result, the added heat stress in cities will be even higher than the sum of the background urban heat island effect and the heat wave effect." say the researchers. This amplification effect has been attributed to the lack of surface moisture in urban areas and the low wind speed associated with heat waves. New residential development and urban expansion on the fringes of cities has been modelled in Sydney to strongly affect minimum temperature s as part of the urban heat island effect. (Argueso , Evans, Fita and Bormann 2013) It is likely a similar effect occurs in Melbourne's new housing developments in the north and west of the city. Most heatwave deaths are avoidable with forewarning and if individuals and communities adapt their behaviour. There are clear physiological limits to human heat (Sherwood and Huber 2010). When those limits are exceeded for extended periods heat stress, heat stroke and ultimately death occurrs. Comparison of the length and intensity of the Melbourne primary heatwave in 2009 and 2014. Source: Victorian Auditor General's Office (2014) Nicholls et al (2007) identified that for people aged 65 years or older there is a 19 to 21% mortality rate once overnight temperatures exceed 24 degrees Celsius. Laaidi et al (2011) highlighted the role of high nocturnal temperatures and the duration of heat using satellite remote sensing of surface temperatures. This temperature data was then compared to demographic data from the 2003 Paris heatwave for central Paris and two suburbs with more vegetation. In comparing mortality and morbidity between high density urban area and suburban areas with vegetation the researchers found that the small 1 to 2 degree difference made by the urban heat island doubled the mortality rate among the more vulnerable elderly in high density urban living over an extended heatwave. The study provided an impetus to mitigate the urban heat island through more vegetation and a method for public health practitioners to identifying hot spots in the future to target those more vulnerable much like Loughnan et al (2013) have done in determining a heat vulnerability index and mapping heat vulnerability for Australian cities. De Munck explained in a AGU 2010 Fall meeting in San Fransisco press conference on urban heat islands (Youtube Video) that a one per cent increase in vegetation reduces urban heat by 0.2C the surface temperature of Paris on a summer afternoon. She explained further that during an extensive heatwave it is the nocturnal minimum temperatures that are important for mortality rates rather than daily maximum temperatures. Age and socio-economic status are also important determinants according to Loughnan et al (2010) who investigated hospital cardiac admissions during hot weather and the socio-demographic and spatial data to help determine public health vulnerability to hot weather. The study reported Hospital admissions for acute myocardial infarction increased by 37.7% for three-day average temperatures ≥ 27°C and by 10% for a 24-hour average temperature ≥ 30°C. Twice as many males admitted than females, and the males were younger, with peak occurrence in the 60–64 years age group. A study in Germany by Zacharias et al (2015) estimates that more frequent, longer duration heat waves of greater intensity may kill five times as many people from heart disease by the end of the century compared to the present if little acclimatization occurrs. If there is 50 per cent acclimatization, then heart disease related deaths during a heatwave would be two and a half the current rate. The study indicates "that the future burden of heat will increase considerably. The obtained results point to public health interventions to reduce the vulnerability of the population to heat waves." This would include heat health warning systems, heat wave action plans, enhanced use of air conditioning, and individual behavioral adaptation as have been adopted in recent years in Australia. 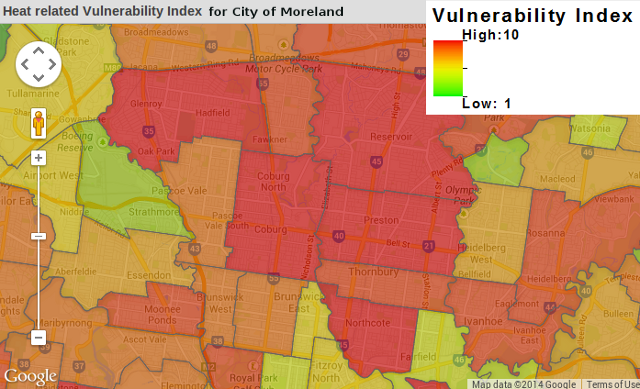 A study by Loughnan et al (2013) assessed environmental, demographic and health characteristics producing a heat vulnerability index, then mapped the heat vulnerability of Melbourne and other Australian cities down to the postcode level using Google. 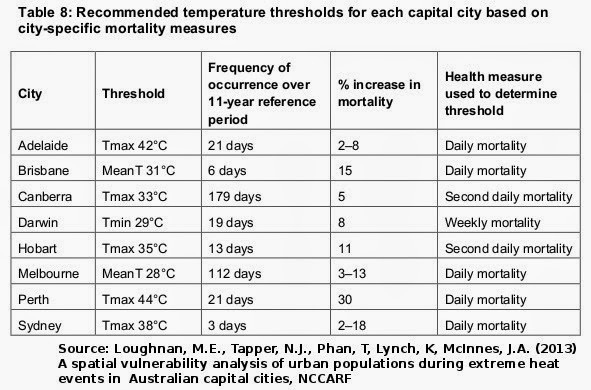 The purpose of the study was to establish a nationally consistent approach to identify threshold temperatures above which mortality and morbidity increases in each Australian capital city. For Melbourne the thresholds for increased mortality was a maximum temperature of 39°C, or an overnight minimum temperature of 26°C or a daily mean temperature of 28°C. These threshholds are different to Loughnan (2010) and Nicholls (2007) due to differences in the age cohorts and diagnostic groups of the data sets. Tong et al (2014) in the study of heat related mortality in Brisbane, Sydney and Melbourne reported that heatwaves appeared to affect mortality more in Brisbane and Melbourne than in Sydney and conjectured that this may be due to more extended heat periods in Brisbane and Melbourne as well as different adaptation and individual behavioural response between the cities. The data showed a propensity for more deaths in heatwaves later in the summer with the elderly particularly females more vulnerable. The authors suggest that menopause reducing thermo-regulation and cardiovascular fitness may be responsible for increased elderly female vulnerability. 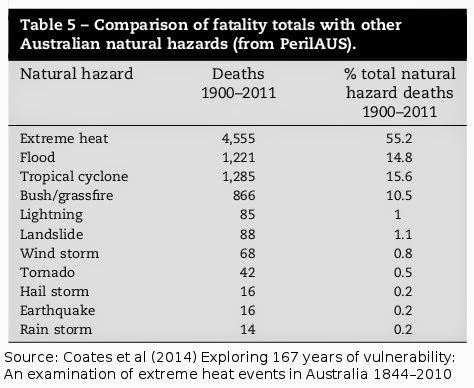 In Victoria the 2009 heatwave and hot spell events highlighted the direct and indirect effect on mortality through heat-stress related fatalities and indirectly through bushfire fatalities. The heatwave in 2009 caused 374 excess deaths, while the Black Saturday bushfires exacerbated by the extreme temperatures, caused 173 deaths. (Department of Human Services 2009) Byard (2013) refers to 400 heat related deaths in Victoria around this time. But the 2009 heatwave also demonstrated that not all people are able to adapt and find appropriate cooling. Raymond (2010) highlights the plight of homeless people who are particularly vulnerable, and often discriminated against when they seek shelter from the conditions in air-conditioned public buildings and shopping centres. The Victorian Council of Social Service (2013) also detailed that heatwaves impact to a greater extent lower socio-economic groups including public housing tenants, renters in general, homeless people, and those on lower incomes unable to afford air-conditioning or fans. Keating and Handmer (2013) utilise cost benefit analysis to calculate the cost of climate impacts to help in decision making of allocation of scarce resources. They provide estimates and projections on bushfire impact on the Victorian Agriculture and Timber Industries and from heatwave mortality. They estimate that by 2050 increases in bushfire due to climate change will cost, with out adaptation, the Victorian agricultural industry an additional $1.4 billion ($46.6 million per annum by 2050), and the timber Industry an additional $2.8 billion ($93.4 million per annum by 2050). 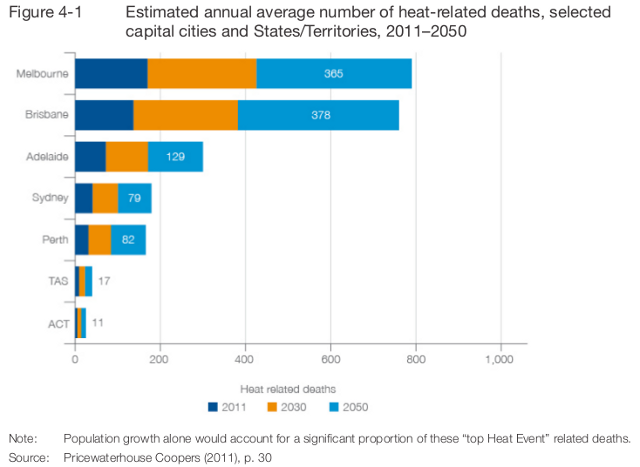 In comparison, heatwave mortality due to climate change, without adaptation, would cause an additional 6214 deaths (402 deaths annually by 2050) translating to a cost of $6.4 billion (or $218 million per annum by 2050). The Heatwave mortality costs are based on McMichael’s 2003 estimate of current heatwave mortality in Melbourne. Cost estimates are based on statistical value of life discounted at 5% and 0.1%. Adaptation is already occurring to reduce heatwave mortality and this is noted by the Victorian Auditor General's Office (2014) in comparing the reduction in excess deaths from 2009 and 2014 extreme heat events and the contribution of management and adaptation strategies that have been put into place. It would be an interesting research exercise to estimate the cost-benefit of this adaptation so far. Table 2: Infrastructure impacts of 2009 heatwave in Melbourne. Source: PPT slide prepared by Climate Institute associated with report: Infrastructure Interdependencies and Business-level Impacts Report (2013). The 2009 Melbourne heatwave highlighted the risks and vulnerability to urban infrastructure. Like McEvoy et al (2012) the Climate Institute (2013) identified that businesses and government are largely unprepared for extreme heatwave events of any magnitude and substantial duration and of the danger for system interactions and dependencies breaking down resulting in cascading system failure. The Climate Institute made specific recommendations for both business and Government planning, management and coordination of heatwave risks to infrastructure. Heatwaves also inflict an economic cost in reduced productivity which is likely to increase in the future with the increase in temperatures. (Dunne, Stouffer and John 2013) The Climate Institute (2013) modelled these costs for Australia under three scenarios of labour supply disruption, with the estimated costs (due to increased labour costs and/or lost production) ranging from 0.2-1.1 per cent of revenue. 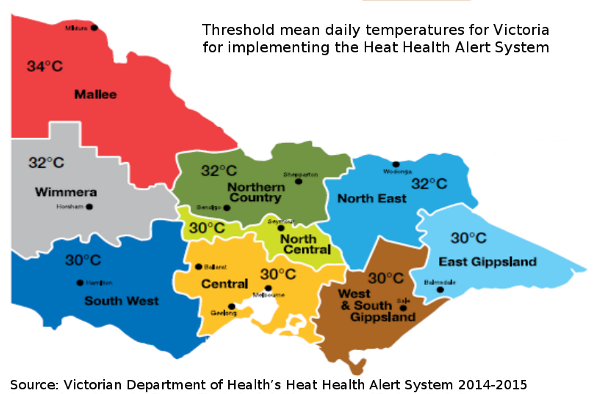 The Victorian Heat Health Alert system, run by the Victorian Department of Health, has been in operation since 2010. (Tapper 2014) The Victorian Auditor General (2014) found the warning system was soundly based and accorded with best practice, but the communication of health messages was not consistent and were not effectively targeted to meet the community needs. Lack of governance at the state level was also demonstrated by a Moreland Council resolution at the Council meeting in October 2014 regarding local heatwave response strategy calling on the Victorian State government "to activate emergency planning measures when the temperature reaches the heat health temperature threshold for three days in a row". Englart (2015) found that in the Emergency Management Manual Victoria, while fire and flood rate numerous mentions in Part 1 – Emergency Management in Victoria and Part 2 – Emergency Risk Management and Mitigation in Victoria, there is no mention of heatwave or heat related risk management, mitigation or adaptation strategies. In Victoria this means transitioning from coal based energy to solar and wind, and perhaps ocean energy and geothermal in the future. (CSIRO 2012) Victoria currently produces about 90 per cent of electricity from brown coal which makes Victorians one of the most carbon intensive on a per capita basis in the world. (Arup 2014) Residential solar photovoltaics are still at a relatively low level of market installation with, for example, just 6 per cent of Moreland households and 7.2 per cent of Darebin households with solar panels. (Englart 2013) The development of wind farms has also been limited due to wind farm planning regulations with wind contributing less than 3 per cent to Victoria’s electricity generating capacity according to former Commissioner for Environmental Sustainability Professor Kate Auty. (Green 2013) This compares with about 27 per cent wind farm capacity in South Australia (AEMO 2013). As Council's are noted as having limited resources and are engaged in important mitigation, adaptation and community resilience building, Wales (2012) recommends that State and Federal government departments should provide policy guidance, funding and support packages “to plan and implement a holistic climate change strategy for their communities”, as well as encourage more collaboration with the private sector to include them in problem solving. We need better heatwave emergency planning and response as recommended by VCOSS (2013), increase building standards for energy efficiency and insulation, programs to retrofit older buildings. (Reeves et al 2010). Increasing the albedo (reflectivity) of city surfaces can make a large impact in reducing the urban heat island effect. Jacobson's study used global climate modelling revealing feedbacks of local changes to the large scale resulted in gross global warming. According to the study the population-weighted air temperature decrease due to white roofs was ~0.02 K, while the global temperature increase was ~0.07 K. Georgescu (2012) has also examined the impacts of increased urban albedo through cool roofs in Arizona and discovered a major unintended consequence of changes to the regional hydro-climate resulting in a 4 per cent decrease in precipitation. Further research by Georgescu (2014) found that different adaptive approaches of cool roofs, green roofs and green-albedo roofs each have their own strengths and weaknesses which can be used for geographically appropriate strategies, but is far from straight forward as Akbari's orginal proposal. Road surfaces cover a substantial proportion of urban areas and are usually black asphalt which absorbs heat contributing greatly to the urban heat island effect. A trial project in Chippendale, an inner city suburb of Sydney, found that streets covered 24 per cent of the land surface area of the suburb. Temperature measurement of two streets, one partially shaded by buildings and a tree canopy and one exposed to full sunlight found there was a 2 degree difference in temperature, both day and night. The City of Sydney is currently trialing pale coloured road surfaces. (City of Sydney 2014, Australian Government 2013). Air-conditioning is now becoming widely used as a personal adaptation to increasing summer temperatures and heatwaves. It is relatively easy to do, although increasing use of air-conditioning is more like a maladaptation. Socio-economic factors are significant in establishment of urban vegetation. Housing density, income, education and immigrant status all influence vegetation cover as neighborhoods develop over time. Education level is a strong predictor of canopy extent. This means there is an important role for public funding and local government policy in establishment and maintenance of urban forest as part of urban planning particularly for new developments and disadvantaged neighbourhoods. (Luck, Smallbone O'Brien 2009). Councils are already proactive in support of urban forestry and vegetation for the substantial community, environmental, and climate benefits. Current Melbourne Local Government area canopy cover is estimated at 11% with tree canopy covering about 22% of public streets and parks while canopy cover on private land is only 3%. Melbourne's current urban forest is vulnerable due to it's lack of diversity, reduced tree health due to lack of rainfall, water restrictions, extreme heat, and urban development expansion, along with a large proportion of trees approaching the end of their useful life expectancy. The development of cities has involved building elaborate sewerage and storm-water systems. By there very nature cities have large areas impervious to water so that during heavy rain flash flooding often results when the stormwater and drainage systems are overwhelmed. In the community more people are becoming aware of the fragile nature of urban living and food security with the impact of extreme weather events such as floods and heatwaves. While there is some concern by government of aggregate impact of climate change on agriculture and food production, little attention has been paid to the fragility of food supply chains and the role urban agriculture could play in urban resilience for urban populations. This has resulted in the upsurge of the Transition towns movement, an increase in suburban farmers markets, backyard permaculture gardening and informal food swaps. Burton et al (2013) detail in a qualitative study the growing interest in urban food security and backyard permaculture utilising two case studies of the Gold Coast and Melbourne as examples. This study provides a window on local communities already responding to climate change by building more resilient communities. currently accounts for 87 per cent of Australia’s transport emissions, mostly private passenger vehicles. Reeves (2010) details that "Footpaths for pedestrian and bicycle traffic were also impacted during the heatwave. In the City of Melbourne, the surfaces of footpaths and roads became very hot, to the extent that pedestrians had difficulty using them. The City Council responded by sprinkling footpaths with water to cool them." As of 2013 29.5% of people in Melbourne’s inner suburbs use public transport for journeys to work compared with 9.1% of people in Melbourne’s outer suburbs. (Australian Goverenment 2013). Mitigating against rising temperatures and extreme heatwaves will require long term action by government to regulate and reduce greenhouse gases to eventually stabilise temperatures. In the meantime climate adaptation measures need to be implemented to reduce the risks to health, urban infrastructure and urban biodiversity. Many of these changes are political or regulatory requiring decisions based at the State Government level who are responsible for land management, regulation of electricity production, planning, public transport, building regulations and many more areas of responsibility. Local Government has a strong role to play in both urban planning and adaptation strategies and emergency preparedness response. All of these areas could be significant in reducing emissions or changing carbon footprint behaviours and in adaptation strategies. PriceWaterhouseCoopers (2011) also identified a need for greater national consistency in key elements underpinning planning and response arrangements for heat events indicating a role for the Federal Government. To reduce greenhouse gas emissions and stabilise temperature will require behavioural change by individuals, action by business and all three tiers of government. To not do so will result in a more onerous climate with greater costs amassing a huge climate debt for our later life and those who come after us as we progress through this century. Akbari, H., S. Menon, and A. Rosenfeld (2009) Global cooling: Increasing world-wide urban albedos to offset CO2, Climatic Change, 95, 3-4, 275-286, doi:10.1007/s10584-008-9515-9. Climate Institute (2012) Coming Ready or Not: Managing climate risks to Australia’s infrastructure. The Climate Institute, 2012. Climate Institute (2013) Infrastructure Interdependencies and Business-Level Impacts Report. The Climate Institute, 2013.
de Munck, C., Pigeon, G., Masson, V., Meunier, F., Bousquet, P., Tréméac, B., Merchat, M., Poeuf, P. and Marchadier, C. (2013) How much can air conditioning increase air temperatures for a city like Paris, France?. International Journal of Climatology, 33: 210–227. Englart, John (2014a) Mass bat deaths in record setting Queensland heatwave. (7 January 2014) Climate Citizen blog. Grunstein, Ron. 2013. Too hot to sleep? Here’s why. The Conversation (8 January 2013) Viewed 23 March 2014. Hansen, A., P. Bi, M. Nitschke, P. Ryan, D. Pisaniello, G. Tucker (2008) The effect of heat waves on mental health in a temperate Australian city. Environmental Health Perspectives, 116(10), 1369-1375. Herring, S. C., M. P. Hoerling, T. C. Peterson, and P. A. Stott, Eds., 2014: Explaining Extreme Events of 2013 from a Climate Perspective. Bull. Amer. Meteor. Soc., 95 (9), S1–S96. Hsieh C-M, Aramaki T, Hanaki K. (2007) The feedback of heat rejection to air conditioning load during the nighttime in subtropical climate. Energy and Building 39: 1175–1182. Huang C., Barnett A.G., Xu Z., Chu C., Wang X., Turner L.R. and Tong S. (2013) Managing the health effects of temperature in response to climate change: challenges ahead. Environmental Health Perspectives. 2013 Apr;121(4):415-9. doi: 10.1289/ehp.1206025. Keating, A. and Handmer J. (2013) Future potential losses from extremes under climate change: the case of Victoria, Australia. VCCCAR Project: Framing Adaptation in the Victorian Context, Working Paper Victorian Centre for Climate Change Adaptation Research, Melbourne. Loughnan, M.E., Tapper, NJ, Phan, T, Lynch, K, McInnes, JA (2013), A spatial vulnerability analysis of urban populations during extreme heat events in Australian capital cities, National Climate Change Adaptation Research Facility, Gold Coast, 128 pp. Moore, G.M. (2013) Valuing and Maintaining the Urban Forest. University of Melbourne. Ohashi Y, Genshi Y, Kondo H, Kikegawa Y, Yoshikado H, Hirano Y. (2007) Influence of air-conditioning waste heat on air temperature in Tokyo during summer: numerical experiments using an urban canopy model coupled with a building energy model. Journal of Applied Meteorology and Climatology 46: 66–81. Raymond, M. (2010), Hot and Homeless in Melbourne, Health Issues Summer 2009 issue 101. Reeves, J., Colleen Foelz, Peter Grace, Peter Best, Torben Marcussen, Shahbaz Mushtaq, Roger Stone, Margaret Loughnan, Darryn McEvoy, Ifte Ahmed, Jane Mullett, Katharine Haynes, Deanne Bird, Lucinda Coates, Megan Ling, (2010), Impacts and adaptation response of infrastructure and communities to heatwaves: the southern Australian experience of 2009, NCCARF – National Climate Change Adaptation Research Facility. 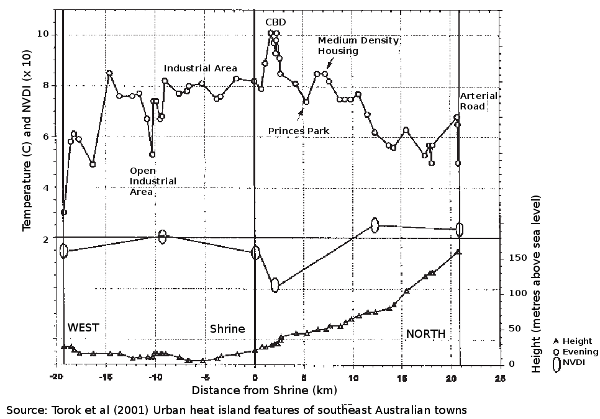 Torok, S.J., Christopher Morris, Carol Skinner, and Neil Plummer (2001) Urban heat island features of southeast Australian towns. Aust. Meteor. Mag., 50, 1–13.